Most places here in Nova Scotia you’re only a stones throw away from the water…whether a lake or the ocean. So I guess no one should be surprised that I love all things nautical. Especially in the summer. 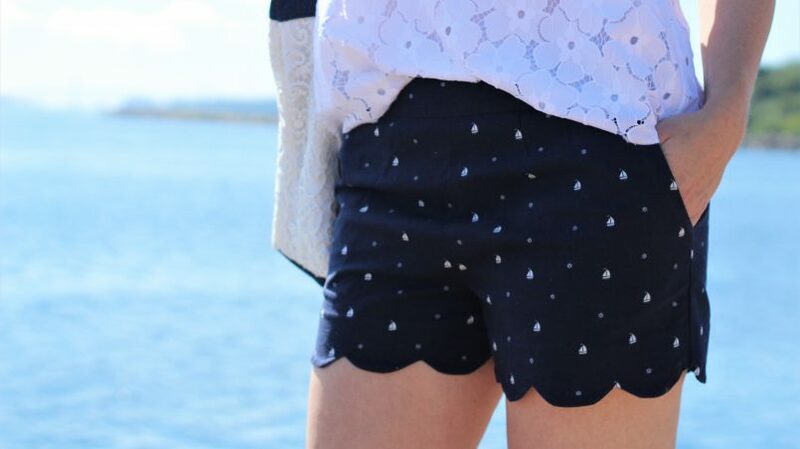 So when I found this cotton twill with it’s itty bitty sailboats…well of course I had to make a pair of shorts with it. It is 100% cotton, with no stretch. I would have preferred some stretch to it but I’ll overlook some things for a cute print. I used M6930 viewB for the shorts. I had made these before (not blogged) but not in the scalloped version. I thought I would give them a try and was even more encouraged when I saw Sarah’s lovely printed scalloped pair. She made hers using Beth’s tutorial. My top is the lovely Ogden Cami by True Bias… my current obsession. I have made so many of these…just made two each for my daughters! 🙂 And they love them…bonus!! I had leftover white lace from this pretty sundress…enough to make this floral Ogden. I feel so great about using up those smaller pieces of fabric. I made a full lining for under this lace of course. Which was really easy to do by cutting the front and back pieces in the lining as well as the lace. I have a few more lace ones in mind for the fall, for underneath cardigans. I want to make all the Ogdens!! Come to think of it….I also lengthened the pattern for a cool rayon nightie….see…it’s all about the Ogden around here. Back view…wow…these are shorty short shorts! Yikes. I am currently living through my own Ogden Cami flurry of makes as well. It is the NICEST top. I want a much for winter for under cardigans too. 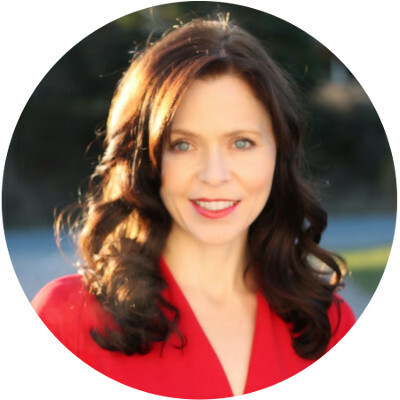 I love your choices – fabric and patterns! I have added the Ogden cami to my ‘must try’ list. I am always looking for patterns to use up scraps. Great job on the shorts and the cami! Love the outfit and the water! 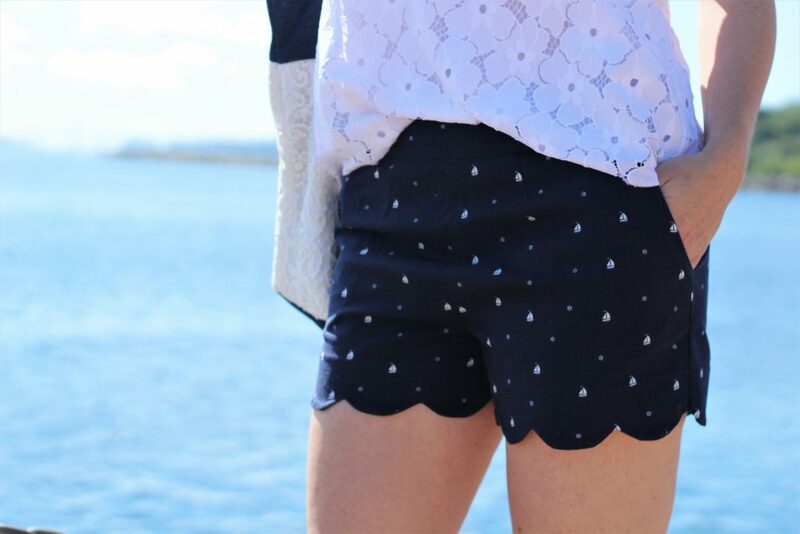 Cute, cute, cute shorts. Love the Ogden top, the lace fabric is gorgeous! The whole outfit is just gorgeous! Love the scallop edges on your shorts and this Ogden in lace is stunning 🙂 I haven’t jumped into the Ogden but everyone I’ve seen I’ve liked. super cute, I love things with scallops. What a gorgeous summery outfit! 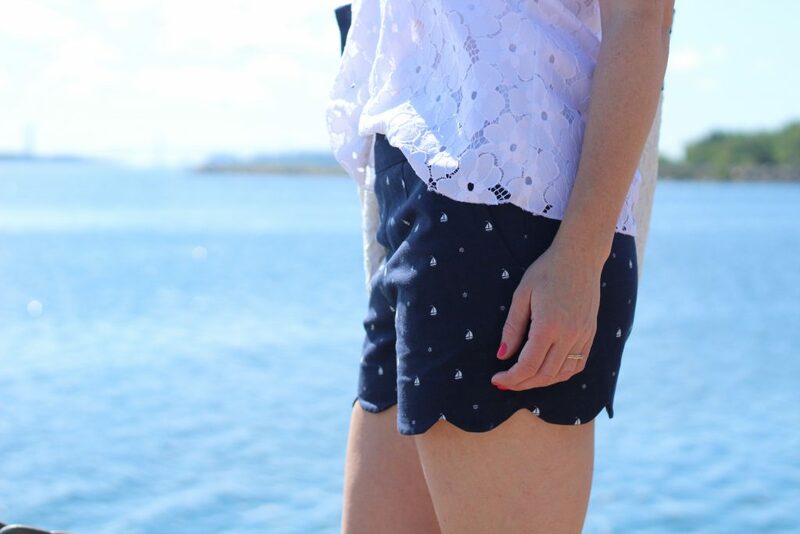 I think your shorts are fabulous with the perfectly scalloped hems. 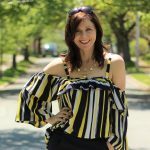 Another gorgeous summer outfit! I love both the top and shorts. Your photos are so beautiful too!